The Beaufort Bar exudes an unashamedly old-fashioned glamour. In a theatrical, Art Deco interior of jet-black and burnished gold décor, the bar is all about champagne, cocktails and cabaret. The bar stands on the hotel's former cabaret stage that was graced by luminaries such as Carroll Gibbons, the Savoy Orpheans and George Gershwin. This tradition is continued by nightly live entertainment with occasional appearances from cabaret legends and up and coming talent. The bar offers one of London's most extensive choices of champagne by the glass and by the bottle including rare vintages from Louis Roederer and Cristal. These are accompanied by classic and new cocktails served with a witty and playful presentation. Nightly live music and entertainment complete the atmosphere. The Beaufort Bar, with its dark luxury, gold leaf and champagne, has inspired an indulgent new afternoon tea. 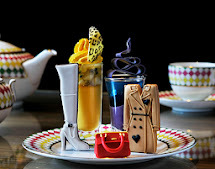 Available on Sundays, the Art Decadent Tea has all the ingredients for a lazy afternoon; chilled champagne, Tipsy Tea cocktails, interesting savory selection, warm scones slathered with cream & jam and a tempting array of gorgeously wicked tea pastries. Crabmeat salad "black & White"
cornish clotted cream and lemon curd. An Art deco Tower that showcased some devine chocolates made at the hotel. The Art Decadent Tea is priced at £42.50 per person and is served in the Beaufort Bar on Sundays from 2:30 p.m. until 6:30 p.m -- Bookings can only be made for the Art Decadent Tea by email or phone.